PALM SPRINGS, Calif. (KABC) -- Seven people were arrested and eight others were being sought Wednesday morning as authorities from multiple agencies launched a gang sweep aimed at the Palm Springs-area Gateway Posse Crips, authorities said. 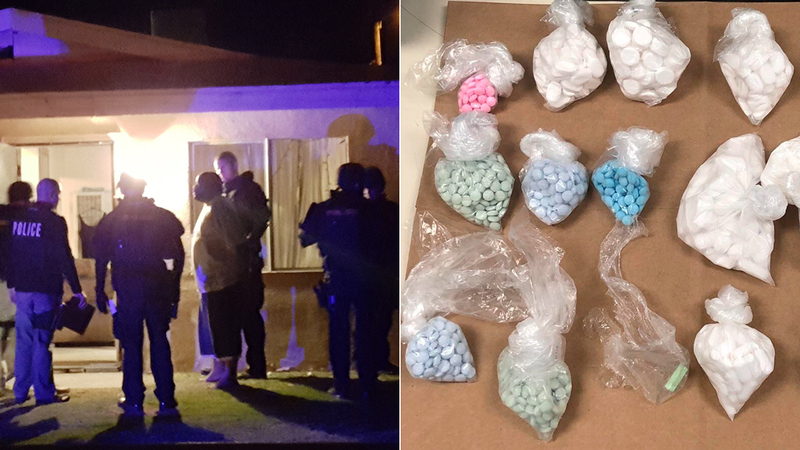 Dubbed Operation Gatekeeper II, the operation that began at 5 a.m. was the culmination of a four-month covert investigation by the Riverside County District Attorney's Office's Gang Impact Team, according to a news release. More than 20 arrest and search warrants were being served in the probe, during which undercover officers have made "undercover purchases of cocaine, crack, methamphetamine, and ecstasy directly from suspected gang members in the residential neighborhood the gang claims as its 'territory,'" the statement said. The seven arrestees were primarily facing drug-related charges. A handgun, heroin, methamphetamine, and ecstasy were recovered in the raid, investigators said. "Today's operation is another example of the outstanding work they do going after the criminal street gangs that are responsible for so much of our crime," District Attorney Mike Hestrin said in a statement, referring to the gang unit, which is comprised of personnel from nine local and federal agencies. According to authorities, the Gateway Posse Crips gang was founded in 1988 and its members have been involved in narcotics sales, homicide and other violent crimes. The group was targeted in 2009 by the so-called Operation Gatekeeper I, which resulted in 17 arrests and the recovery of 37 firearms, investigators said.